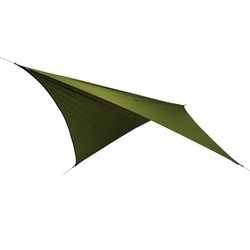 ENO FastFly Sil Nylon Rain Tarp. Whether it's a cool, spring drizzle or those searing, summer rays, the FastFly offers quick protection from nature's milder annoyances. It goes up in a heartbeat with only four guy points, but provides a sprawling overhead shelter. For harsher conditions, the ProFly or DryFly are happy to oblige. Now available in Silicone Impregnated Nylon for uber water protection and a lighter weight. Eagles Nest Outfitters. Unfolded dimensions	(L x W) 11' 9" x 11' 9"